The Fire in the Texas State Capitol. Shortly before noon on Nov. 9, 1881, the wind blew out of the north and a light rain fell from a sky as gray as an old Confederate Army coat. With the norther dropping the temperature, maybe the porter sweeping the floor in the Attorney General’s office on the Capitol’s first floor had in mind warming up the room. Or maybe Henry McBride just wanted to get rid of a basket of wastepaper the easy way, by stuffing the trash into the heating stove. Whatever his intention had been, McBride moved on to the next room, pushing his broom. But soon he smelled smoke. Running back into the room where the stove sat, he found that pieces of burning paper and embers had fallen onto the wooden floor. As he watched in astonishment, the fire quickly spread. All he could do was run. But soon the fire bell atop City Hall began ringing. The number of clangs informed the volunteer fire fightersrushing to the hall to get their equipmentthat the fire was in the 8th ward, downtown Austin. The limestone capitol had been a bonfire waiting to happen. Gov. Oran Roberts, remembering the 1865 robbery of the state’s treasury, feared history was repeating itself. Holdup men must have started a fire in the Capitol to divert attention, he thought. 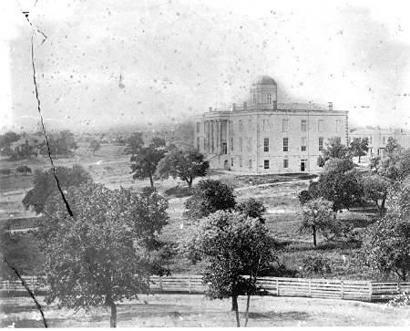 The governor quickly ordered several Texas Rangers who had been camped on the Capitol grounds to go guard the vault. The only enemy on this day, however, was the natural consequence of fuel, oxygen, and an ignition source. “It was a thrilling scene,” the next edition of Texas Siftings reported. “The fire’s demon cruel tongues licked the fair proportions of the historic pile, while huge volumes of black smoke poured from the doomed building, and settled over the fair city…like a sable funeral pall, enveloping in its somber folds the spires and domes that glitter on the several hills of the Capital City…while the toot, toot, toot of the fire engine, and the hoarse profanity of the enthusiastic volunteer firemen, seemed a solemn and appropriate dirge as the old sarcophagus crumbled. Low water pressure at the nearest hydrant, which was not all that close due to the fact that two previous sessions of the Legislature had not seen fit to appropriate money for fire hydrants on the Capitol grounds, prevented the volunteer firefighters from putting much more than a light mist on the blaze. In two hours, only a blackened limestone shell remained. 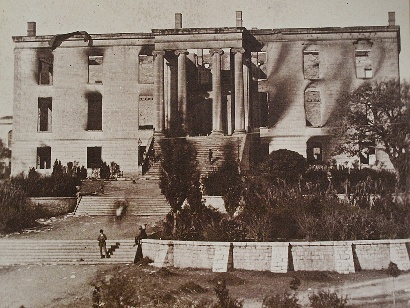 Capitol building after it burned on Nov. 9, 1881. Though newspaper reaction to the loss of the Capitol varied from near indifference to open sarcasm, many government records dating back to the days of the Republic burned in the fire. Geologic samples and a collection of cultural artifacts, including shields and lances seized by Indian-fighting Texas Rangers also went up in smoke. In addition, 8,000 books were incinerated. If the burning of the statehouse was truly Henry McBride’s fault (he never denied the dubious honor, but someone else’s shoddy installation of the stove pipe also played a role), the fire did not cost him his job. He stayed on the state payroll until 1931. In truth, though McBride may have accidentally started the fire, state officials already had been planning for a new Capitol, a grand structure that would be a much more fitting home for the government of the nation’s largest state. But the fire did speed up the process. Since the new Capitol would be erected where the old one stood, the fire might even have saved the state a little money in wrecking costs.